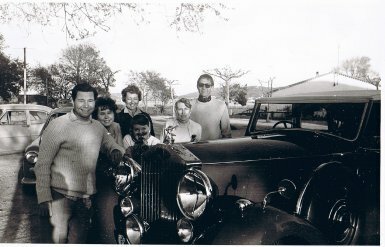 This is Reg, with his family, my parents Adam Hall / Elleston Trevor, my mom Jonquil, and a friend of a journalist, in south of France. I was probably in a boarding school in the UK. It was my father's old Rolls, although he could hardly afford the petrol! 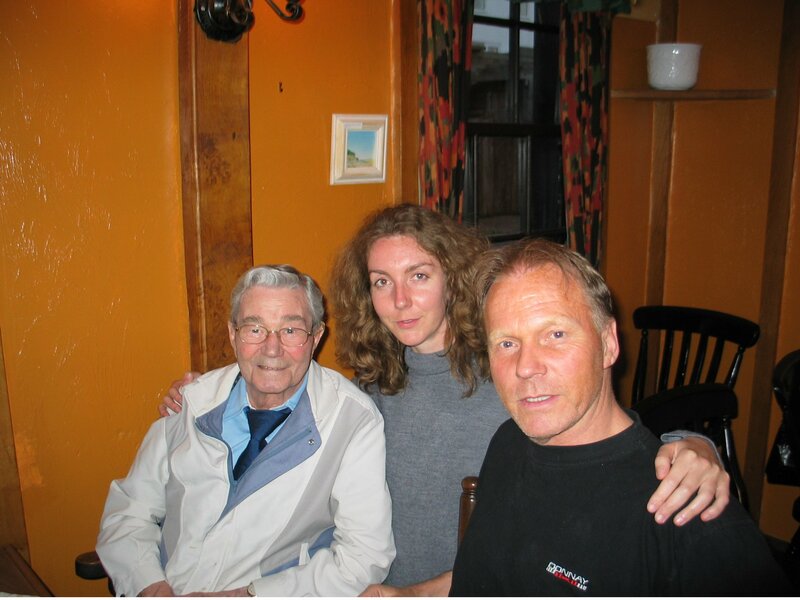 For years, Reg came down to Valbonne in south of France to visit me and my parents, with his family. I was too young to realise how much he gave me happiness in a childhood that never really happened. I had an old upright piano in my room and one day he sat down and rippled off Honky Tonk at an incredible speed. I didn’t want him to stop playing. In Budleigh a few months ago, I asked if he would play me something; it was really an excuse to get him interested again in his music. He was lonely after Lilly died and didn’t feel much point in doing anything. He had three typewriters in his office and I hoped he'd write a sequel to The Little Clown. But that didn’t happen. It often happens in show biz, when a talent like Reg stops performing, people drift away. They forget, until the star dies, then everybody remembers again, for a while. One day after spending some time with Reg talking about his times in France with us, I was leaving him at his doorstep, and he looked wistful, he said, 'I hope you come again, you're my only friend now'. I was so sad to hear that. He called me a few time over the past three years and it was great to hear his upbeat voice. He loved discussing his art, and I gave him two paintings of mine which he framed and put on the wall. I was hoping it would inspire him to start painting again, anything but see him just watching TV on his own. He gave a lot to many. As a boy, I saw him the first time on stage in Brighton. He was playing a game of tennis on stage. There were no strings in their rackets, and there was no dialogue. Silence. Just Reg (I don't know who his stage partner was) pretending he was sending an invisible tennis ball back across the stage. Reg had a very rare (especially today with coarse toilet humour) gift for turning people into hoots and wails of tears of laughter. He could have stood there doing nothing, and the wave of laughter would ripple through the crowds. Reg gave pleasure and good feelings to millions. One day in France, near Golf Juan, Reg was staying in a house that was for sale, not far from my parents home. It was raining a tempest and my father, always ready for a prank when Reg was around, got up onto a nearby rooftop. Reg soon knew something was up and went out onto his veranda wondering what my father was doing in the downpour on a roof. My father had a make-shift megaphone and shouted to Reg across the street 'Come in number four!'. Reg was in stitches. Half an hour later, he came back and looked at me with slight surprise on his face, and said 'Hello, where did you come from!'. I'll never know if he had genuinely forgotten I was there, or if it had been a natural intention to make something comic out of an ordinary situation. Reg was staying in another apt that was on the market near Antibes while visiting me and my parents (author Elleston Trevor / Adam Hall - Quiller) and an estate agent called and Reg answered the phone thinking it was me or my father, and the agent spoke a little English and asked if he could bring a prospective buyer around in ten minutes. Reg later described how he started stuffing hairbrushes, toothpaste tubes into his pockets, down his trousers, telling his family to do the same, so it would be nice and tidy for the agent. His description over dinner that evening had us and some of the restaurant staff - who didn’t even speak English - practically under the table. observations and turning them into something that got to people and got mascara running (he loved it when my mother's ran) and my father howling with laughter until he was crying. One summer Reg was down again in Valbonne and we all got into an old Rolls and rolled off to Spain. My father stopped by the road to have a picnic. Reg waited an hour after we had all finished eating, probably so we wouldn't choke, and proceeded to mimic my father stuffing his pipe, pursing his lips, drawing on the tobacco, then eating his sandwich in his slightly affected ways, (partly for Reg's benefit to give him 'material') and we were all practically unable to breathe from the convulsions of laughter. If a Spanish cop had pulled up and seen us in paralytic fits, I would have simply explained that Reg Varney was in the car. people.. So he would wait, then someone started talking about the war and the army and Reg switched on instantly the impersonation of a Sergeant Major (handlebar moustache type) and Reg's accent got my father and us under the table. Reg never laughed when he was 'working them' as he called it, he stayed deadpan. A slight shift in expression, a subtle change of eye movement, or a slight touch of Charlie Chaplin as he got up and walked across the dining room in a restaurant... everybody in there was also under the table, whether they spoke English or not. I never saw much of On The Buses, or his other shows, only the tennis game, and I was on set when he was shooting 'Buses' and Reg had to 'eat' a lot of chips. I was behind him off camera and was amazed to see him tossing the chips over his shoulder for a grip to catch. I was too young and naïve and thought he was meant to eat them all. subconsciously. I asked him in Budleigh early 2008, what was his secret, and all he said was it's timing, just waiting for the right moment. I asked him if sensing the mood in the audience, he said yes, sometimes, you were up against a brick wall, they were just cold, so you had to warm them up. 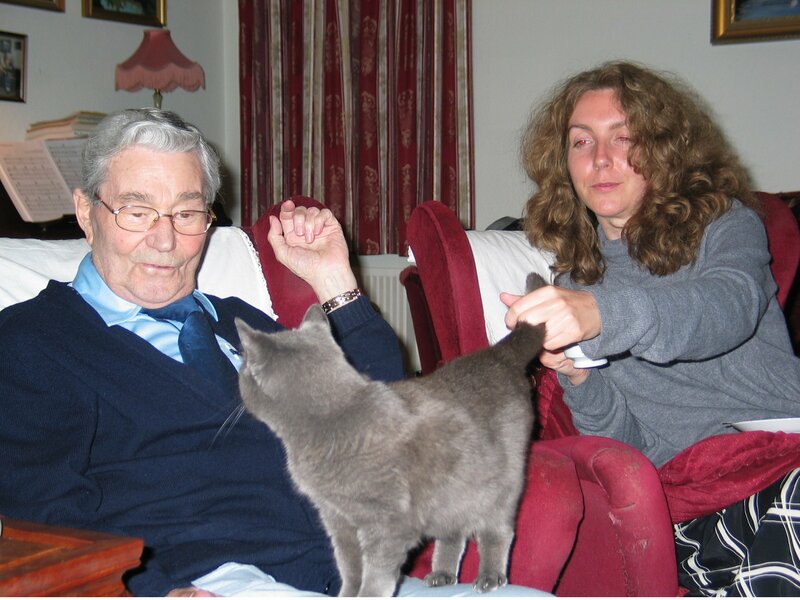 I held Reg's hand the day before he died, stroked his tired forehead, told him I loved him. I put a photo of my mother, who he was very fond of, into his hands, but they shook too much, and he cussed 'Oh bloody hell!'. I made sure he didn’t see my tears, seeing him so frustrated, probably thinking why is this happening. When I came in the room, he said 'Hello mate!'. 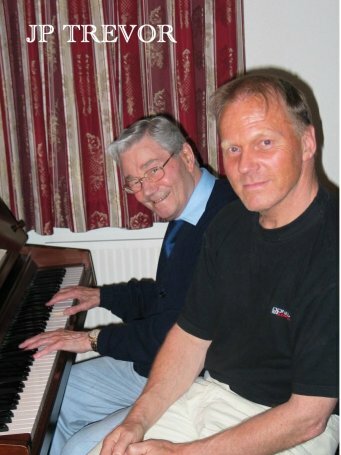 I'm not very good at this thing, I just wanted him to get better somehow, and feel the need to sit down at his piano, or paint, or write, or just be, so I could kneel down at his letter box and shout some memory and wait for his answer 'Hold on a bleedin minute, I'm on my way!'. And that would put a smile on my face. I never really had a real father and Reg knew this. We had discussed life recently. One evening he stood in his doorway as I was turning my car, and he said 'Love you son'. That got me going. I don’t know his relationship with his own family, but I'd say there was a lot of love. Couldn't be anything else. Reg gave out a lot of that. Almost to the end, and I don’t know how he did it, but his carefully curled hair style at the front, that had not changed since I knew him in France as a young boy. And the sparkle and that grin was there, even hours before left us. A big wide smile. Then the fight and I held his hand again and said if you want to go now Reg, that's Ok, because I don’t want you to be in any pain. I quietly said 'come in number four', to see if he was still online, a faint smile..
JP Trevor is recognized as one of most imaginative and gifted artists in the industry. 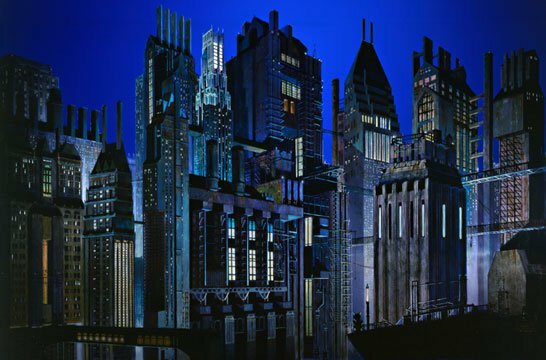 He started painting around age ten and later trained in special effects and matte painting under his mentor Harrison Ellenshaw at Walt Disney productions, where he did mattes for STAR WARS. Major collectors of his beautiful and powerful art include John Hancock III; Lewis Gilbert: film director of 007 MOONRAKER; John Howard Davies, producer: MONTY PYTHON; and The Honourable Idar Rimstead, former US Ambassador to the United Nations.